The Guishan Island, more popularly known as the Turtle Island, is located off the coast of Yilan County and is a famous spot for whale watching and dolphin watching in Yilan. As the name suggests, the Turtle Island is a small volcanic island that is shaped like a giant turtle out at sea. 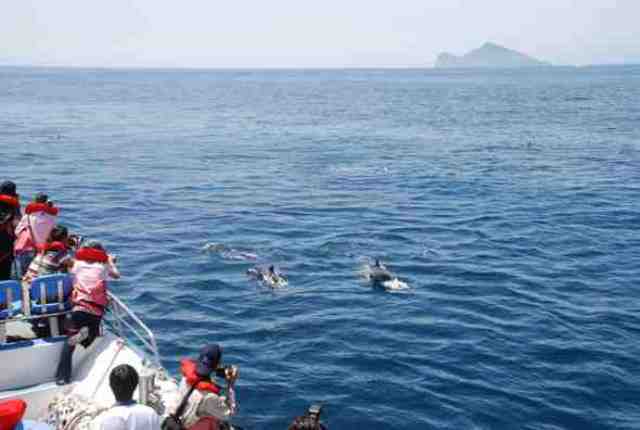 The island is not only one of the third largest fishing grounds of Taiwan but its Kuroshio Current brings amazing dolphins and whales to the surrounding area. A dolphin and whale watching trip to the Turtle Island starts at the Wushih Harbor. Visitors may take the train and get off at Toucheng Station. From there, buses by Kuo-kuang Motor Transport can take you directly to the Wushih Harbor. If buses are not available, a cab will be your next bet. Walking from the train station is possible as it takes about 30 minutes to get to the harbor by foot. Spotting dolphins and whales needs a lot of patience and a little bit of luck. To ensure that most visitors will leave satisfied with their trip, boat companies would sail to sea at 3 in the morning to check which areas around the Turtle Island have a concentrated number of marine creatures. This then ensures visitors an 80% chance of spotting such creatures later in the day. This method, however, only goes for dolphins as whales are much harder to predict. One a clear sunny day with a soft sea breeze, it will be easy to spot dolphins within 30-minutes into the trip. In the midst of the glittering waves of the sea, spinner dolphins and bottle-nosed dolphins can easily be spotted gracefully swimming the seas. Sometimes, the dolphins can be seen jumping high out of water and diving back, much to the delight of the watchers. Wearing a life vest is necessary when riding on the boat. Spring, summer and autumn seasons are the best seasons to go whale and dolphin watching near the Turtle Island. Know though that tours to the Turtle Island are only open to the public from March to November of every year. In addition, only a limited number of 250 visitors are allowed per day. Those who wish to visit the island must then make reservations at least 15 days in advance to ensure their spot. Also know that passports must be brought on the day of visit. For those who are unfortunate and do not see any dolphins or whales, don’t worry about missing the experience as the beauty of nature surely does not disappoint. The amazing view of the Turtle Island and its beautiful, green vegetation will be enough to leave you mesmerized. Some visitors can even enjoy hiking on the island by challenging themselves to get to the highest point of the Turtle Island. Because spotting dolphins and whales is such an exciting experience, many visitors have gone to Yilan for a day trip just for an amazing oceanic experience. Luckily, Yilan is not too far away from Taiwan’s capital city, Taipei. Whale watching and dolphin watching in Yilan will certainly give you an unforgettable visit as these magnificent cetaceans are truly astonishing creatures of the sea.